WASHINGTON — In a move that may ease — or exacerbate — spiraling tensions with Israel over a potential Iran nuclear deal, the White House has decided against snubbing America’s leading pro-Israel lobby and will send President Barack Obama’s national security adviser and U.N. ambassador to address its annual policy conference. 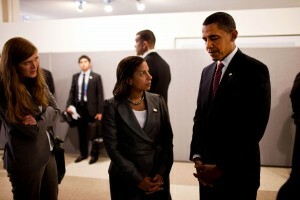 The American Israel Public Affairs Committee announced Thursday that national security adviser Susan Rice and U.S. Ambassador to the United Nations Samantha Power will speak to its conference that begins this weekend. U.S. officials had floated the idea of sending a non-Cabinet level official to the event to show the administration’s deep displeasure with Israeli Prime Minister Benjamin Netanyahu’s speech to Congress next week, in which he will argue against an Iran deal. In their as-yet unscheduled appearances at the AIPAC conference that runs from Sunday to Tuesday, Rice and Power will stress the importance of the U.S.-Israel relationship and the administration’s commitment to Israel’s security, according to American officials. But, they will also make the administration’s case for the ongoing negotiations with Iran before an audience of more than 16,000 pro-Israel activists that is likely to be hostile to the talks and deeply concerned by growing animosity between Obama and Netanyahu and their top aides over the prime minister’s speech and his opposition to one of the president’s signature foreign policy goals. In a break with protocol, the invitation for Netanyahu to speak was orchestrated by Republican congressional leaders without input from the White House or State Department, angering senior administration officials who believe it was politically motivated. Netanyahu declined an invitation to meet privately with Democratic members of Congress and a number of Democrats have said they will not attend the speech. No senior U.S. officials will meet Netanyahu during his trip to Washington. The administration has said the visit is too close to Israel’s upcoming elections and it doesn’t want to demonstrate any favoritism. Both Vice President Joe Biden and Secretary of State John Kerry will be out of the country for the visit’s duration on travel that was organized only after the prime minister’s trip was announced. The administration’s choice of Rice and Power to address the AIPAC conference, at which Netanyahu will also speak, is an apparent effort to try to tamp down an increasingly vitriolic back-and-forth between the U.S. and its top Mideast ally. But, it is not at all clear if it will have that effect. And on Wednesday, Kerry openly questioned Netanyahu’s judgment in opposing a potential Iran deal, recalling his support for the 2003 Iraq war and prediction that it would bring stability to the Middle East. “He may have a judgment that just may not be correct here,” the secretary told a congressional hearing. White House spokesman Josh Earnest said sending Cabinet members to speak was consistent with the administration’s participation in past AIPAC conferences, other than the two times Obama spoke himself, and that scheduling the speeches this close to the conference wasn’t unusual. “Certainly if it’s perceived by some as an effort to demonstrate bipartisan support for the relationship between the United States and Israel, that would be great,” he said. At a Capitol Hill news conference on Thursday, House Speaker John Boehner rejected Rice’s criticism, arguing that a “bad deal” with Iran would be destructive. Rep. Nita Lowey spoke to Netanyahu earlier this month and suggested that he deliver his speech in the congressional auditorium behind closed doors, a venue that accommodates all lawmakers and would allow for any classified information that Israel might have on Iran’s capabilities, according to a senior House lawmaker. Associated Press Writers Donna Cassata and Connie Cass contributed to this report.